Hi, my name is Carelia. I am 48 years old, petite gal (5'4 to be exact) mother of two awesome grown-up sons and with a wonderful and supportive husband by my side. I am originally from🌴Honduras, but currently residing in North Carolina, USA. 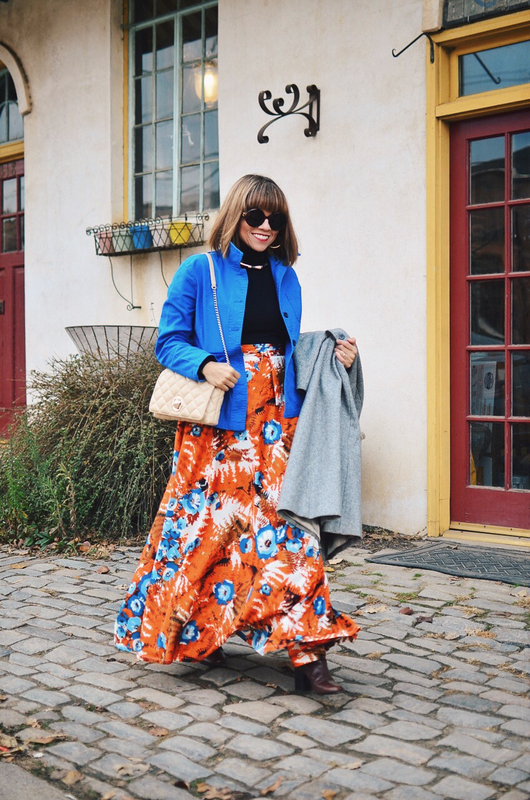 I created this blog as a hobby and to document publicly my outfits. Hopefully I can encourage women regardless of their wardrobe size, age and body type to #DRESSFUN. I'm a firm believer that age, size, and income don't matter when it comes to style. I consider my style as an extension of my personality, and I am a flexible and spontaneous person. Therefore, you will discover those characteristics in my outfits. Some people have a style formula, however, if you look at my outfits, you will realize that I don't follow a particular formula or have a cookie-cutter style. I'm an emotional dresser for sure. While navigating through my blog, you will also find out that I have a weakness for mixing vintage garments with contemporary and classic pieces. These type of combinations help me to create one-of-the-kind outfits. My blog is simple, modern and easy to navigate. I must warn you that I'm not a professional writer, therefore, don't expect fancy writing, however, expect a fun and outside-the-box style. If you like to dress fun regardless of your style, I invite you to join the hashtag #DRESSFUN. Use it in all your ootds, layouts or anything fashion in your Instagram feed. We all can make this hashtag a fun place to browse and also a great source of inspiration. Hola﻿, mi nombre es Carelia. Yo tengo 47 años y soy madre de dos hijos maravillosos y la esposa de un hombre encantador que me apoya totalmente. Yo soy originaria de Honduras, pero resido en los Estados Unidos en el estado de Carolina del Norte. Yo comencé este blog con la mision de incentivar a las mujeres de to toda edad, tipo de cuerpo y tamaño de ropero a que se vistan con un estilo divertido. #DRESSFUN. Yo creo firmemente que cuando se trata de tener un buen estilo la edad, el cuerpo y estado economico no importan. Mi estilo de moda es una extensión de mi personalidad. Yo me considero una persona flexible y espontánea, por lo tanto ustedes encontraran esas características en mis conjuntos. También se darán cuenta que me fascina mezclar ropa de vendimia con la moderna y la clásica. Mi blog es simple, moderno y fácil de navegar. Les anticipo que yo no soy una escritora, por lo tanto, mi escritura es sencilla, pero mi estilo muy divertido. gorgeous! I love your blog! You look amazing, love the shoes you are wearing and your blog. Thanks Leen!! I appreciate your visit. Aww! Thanks so much Sophia! Such a inspriation to us Latina women. Especially for the younger generation like myself. Thanks so much Vanessa! I really love to hear that I can inspire young ladies as yourself. Thank you for taking the time to share your style here! Your blog has reminded me that style is supposed to be fun and playful! I had forgotten that somehow, so thank you! It's my pleasure! Thank you for stopping by my blog. It makes me happy to inspire readers. Hola Carelia, saludos desde Santiago de Chile, descubrí tu blog y de verdad quedé impresionada con tus hermosos outfits, colores y combinaciones espectaculares, estaré pendiente de todo lo que publiques... Felicitaciones y gracias por compartir!!! Muchas gracias, Mave! Me alegra que te hayan gustado mis combinaciones. Es un placer para mi compartir con mis lectores mi estilo. Just found your blog via 40+ will be officially joining the crowd next month. Congrats!!! and remember 40s are the new 30s. You are such an inspiration! I am starting my fashion blog soon, and will definitely use the hashtag. LOVE! Hi Sara! It makes me happy to inspire others and I'm deeply glad you found my blog useful. I wish you the best with your new blog and of course, have fun in your journey. Buenas Tardes. First off I cannot believe you are 45! Honestly I had been looking at your instagram posts and thought you were in your 20's. Love the premise of your blog 'Encouraging women regardless of their age,body type or wardrobe size to #DRESSFUN'. What an inspirational concept. I hope to add some fun pics to #DRESSFUN. All the best to you! I love your unique style. You are inspiring me and my female friends to forget about fashion rules and wear what we love. Merci for that. Thanks, Alais for your sweet comment. I'm more than happy to know that my blog is inspiring you and your friends. Aww, thanks! I'm so glad you found me. Welcome to my blog, I hope you enjoy it. You are seriously the cutest! You have tapped into my own style philosophy and I am a big enthusiast in mixing vintage and modern pieces. Also, never taking yourself to seriously and having fun with fashion at any age! Love it! Thanks so much Gisela! I really love the idea of mixing vintage with new. It's a fun way to create unique looks. I'm glad you are here.